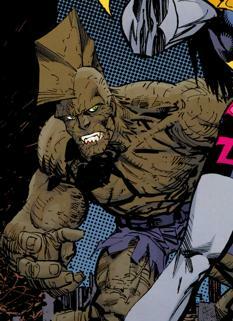 Powers: Dark Dragon has vast super human strength. His legs are strong enough to enable him to leap a maximum height of 460 feet straight up in the air, and a maximum distance of 945 feet. He is capable of lifting (pressing) approximately 34 tons. He is very nearly impervious to flame. His skin acts like a bullet proof vest; a bullet isn’t capable of penetrating it but a sharp knife thrust by a super human arm can. In the reality that spawned Darkworld, Earth was under the total control of the time-travelling supervillain known as DarkLord. The media was just one of the many tools that DarkLord use to subjugate his people which meant that a large amount of propaganda was utilized, keeping the residents of this war torn planet somewhat placated. This media control also meant that when the alien Emperor Kurr was betrayed by his head scientists, Rech and Weikko, the television broadcasts used to fill his amnesiac head contained the propaganda which left him in support of DarkLord. Emperor Kurr was still taken to Hillman Hospital where he adopted the name Dragon after being called it by nurse Ann Stevens. Dragon was chosen as a special covert agent by DarkLord and was hidden on the Earth in the Image Universe shortly before Darkworld was destroyed. He was to lay low until events were manipulated so that this world’s Dragon would be dispatched to yet another timeline. His undercover role then saw him assume the role of his doppelganger, rejoining the police force in light of the huge decrease in the superhuman community that meant he could remain localized. Dragon himself had lost some of his powers due to the Nega-Bomb’s explosion, so he was not hidden in the Covenant of the Sword facility that Damien DarkLord had been using. He ended up moving in with his double’s former partner, Alex Wilde, where the couple seemed to have fallen in love. When the true Dragon briefly returned to his homeworld, this Dark Dragon’s ruse was exposed. A mighty battle took place between the two Dragon’s which saw the Darkworld version caught in an explosion caused by a crashed fuel truck. He was left badly injured but maintained his pursuit of Dragon and Alex Wilde until he was hurled through a portal into the Void. He was assumed trapped forever but Dark Dragon’s resourcefulness matched his more heroic counterpart. Dark Dragon came across the homeworld of Mister Glum where he was someone that was hated and feared by the population. He took exception to these feelings and slaughtered the entire planet’s populace. The now scarred Dark Dragon remained on this devastated planet until Glum and Dragon arrived, following a fight with Deathseed. The brutal confrontation that followed saw the injured Dragon losing a leg to drop Dark Dragon down a massive shaft that had been intended by Mister Glum to finish them both off. Glum took the Dragon and his family back to Earth, abandoning Dark Dragon to his fate. He had one brief attempt at journeying to this third version of Earth but was defeated by Vanguard as he searched Dimension-X for the long-missing She-Dragon. Dark Dragon remained trapped on Glum World until She-Dragon and Angel Dragon arrived looking for a way home. They had unwittingly led the slave-driver Battle Axe to this planet but passed through a portal before noticing they were being hunted. Before she could follow, Battleaxe was halted by Dark Dragon and an uneasy alliance was formed. The couple attempted to murder both Dragon and She-Dragon but Dark Dragon was apprehended and sent to prison where he remained for a few years. Battleaxe tied to break him loose as he had impregnated her and their child, Battle Dragon, and the villainess felt that he needed his father. She was instead arrested and imprisoned herself. Ronald Winston Urass manipulated events using his wealth and political connections to create a situation where Dark Dragon could prove to be heroic, foiling an attack upon Stronghold Penitentiary by an army of robots (secretly built by Urass). He was injected with blood belonging to Dragon that allowed Dark Dragon to finally fully heal and restored all of his powers. Dark Dragon was released on parole and once more confronted Dragon, hoping to kill him and take his place. Unfortunately, Dragon was now back to his original persona of Emperor Kurr. Kurr’s ruthlessness allowed him to win their duel and he smashed Dark Dragon’s head into pieces before eating his brain, ensuring that there was no chance of his duplicate regenerating.